In today’s competitive job market, making the right first impression can help you get your foot in the door of any company. The first impression a potential employer will have of you depends heavily on the way you present your resume. A professional resume contains the right information and helps you stand out among a crowd of similar candidates. The statistics are clear. The average time recruiters spend looking at a resume is between 5-7 seconds. Although short, this is enough time for a recruiter to either place your resume among a pile of prospective candidates or toss it with other applicants they may likely not reconsider. Customize your resume to make it specific to the position you are applying for. To do so, you must first review the job description and fully understand the responsibilities of the role. Determine what skills the employer may want to find in an ideal candidate and highlight any relevant skills and/or experiences you may have. Even for less relevant experiences, it is important that you emphasize transferable skills that can be used from one job to the other. Given the short amount of time your resume is reviewed, arranging your resume in bullet points rather than paragraphs will better catch the reader’s attention. Recruiters and hiring managers want to be able to quickly skim your resume for skills and accomplishments that stand out. Keeping those key differentiators hidden in long lines of text can ruin your chances of being considered for the position. Chronological - This format is traditional and most commonly used. Arranging your work experience from newest to oldest allows you to highlight your career progression and provide ample details about job duties and accomplishments. Functional - This format is useful if you are entering the workforce for the first time or have large employment gaps. This skill-based format allows you to demonstrate your qualifications by highlighting relevant skill sets and downplaying work experience. Combination - This format is a chronological and function hybrid that combines a career summary (made up of skills and qualifications) with an employment history. This format allows you to differentiate yourself with an introductory career summary while still providing the traditional employment timeline that most employers prefer to see. Including metrics throughout your resume is an effective way to highlight your accomplishments. Whether it’s the number of people you managed or the amount of revenue you helped generate, quantifying your successes will give you more credibility and help you stand out. Employers rely on software applications like Applicant Tracking Systems (ATS) to streamline their hiring process and filter resumes. ATS looks for specific keywords used in the right context to your employment history. To find the right keywords, review similar job postings to cull ones that are most commonly used. On average, every corporate job opening attracts 250 resumes. Out of those resumes, only about 4 to 6 people will be called for an interview and only 1 will be offered the job. 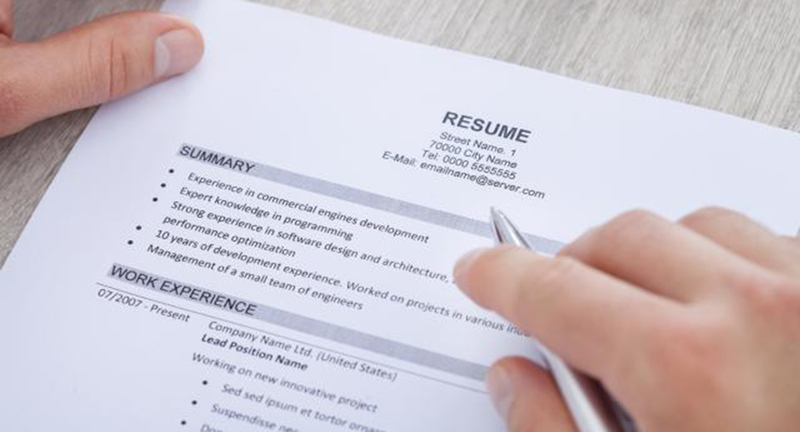 Perfecting your resume does not mean your preparation should stop there. As 93% of recruiters are likely to look at a candidate’s social media profile, learn how to spruce up your LinkedIn profile. If you’re looking for a new career opportunity, view our open positions and apply to a new job today!